This little fella hitched a ride home with us. Guess he’s ours, ya think? Congratulations!! He is adorable. What a blessed little Scottie to have found a home with you. Wonderful. Tell us more. Is it a “he” so he can be my boyfriend? Get out the white paint and put some patches on the newbie! Kismet, say what you really want. You (in your beady heart) want the dog painted in light blue and the nose painted in orange. Wonderful news !!! Such a handsome boy !!! We wish you a long, blessed and healthy life together. Can’t wait to hear his story. Yay!! Yay!! Yay!!!!! 💙!!!!! Or, you are his!! ❤️!!! OMG!!!! YES, YES, YES! I am filled with joy for you and the dad peep! This is the best “best” news we’ve had in a long time! Please tell us real soon the back story to this marvelous pup who is just too, too cute! We want to know everything! In the meantime, Finley and I will celebrate your good fortune while we wish you every blessing for a lifetime! Oh YES!!! This is wonderful! Does he have a name? Congratulations on your new family member!! What is his name? He is a very handsome Scot!! Mummy wants one too. Welcome to Blogville, little one. Yeah! He looks like s good find! Arrrroooooooo! So what’s his name? How old is he?? How much does he weigh?? Sooooooo happy for you and the Dad peep! SQUEEEEEEEEEEEEEEEEEEEEEEEEE!!!!!!!! Oh we are soooooooo happy for you!!! Introductions, please! We can’t wait to hear the story!!! Welcome home little one! You might not know it yet, but you just won the lottery on love and affection. We can’t wait to see what mischief you get up to, the holes you will dig and the toys you will destroy. A great big AROOOO from Bonnie and Kenzie, the wee Scottie girls. Yippee! There’s a new Scottie in the hood! You hit the jackpot, little guy. Mac and Jennie send their best, and we’re looking forward to hearing your story….and your name! A.R.O.O.O.O.O.O!!!!!!!!!!!! Congrats and hallelujah! Name, weight, time of birth, number of fingers and toes….. errrr no wait that’s whomans. Name, and age, plz. Soooo happy for you!! We are all happy for you.He does not look like a puppy, but he is adorable. More details please! OMD!!!!!! CONGRATS!!!! What a handsome fella! I can’t waits to gets all the details! pees: you gets the cutest stowaways! Oh yes, a true winner for sure!!!! Congratulations and can’t wait to hear the details and follow the escapades! Woo Hoo and Arrrroooo!!!!!!!! Saxby and I say this is the best doggone news we have heard today! Your puppy is adorable! Time to sit back and listen to how he stole your heart, where he matriculates from and how darn excited you are to have a Scottie in the house again! We are so happy for you and the Dad Peep! Congratulations and Happy New Scotty to you’all – so wonderful to see you keep with the Scots! Humphrey, Cherry & I wish you all well in your future endeavors of house ‘training’ and alll that other wonderful stuff — Do you have a name for him?yet?? Can’t wait to watch him grow up!! All our best..
OH, WHAT WONDERFUL NEWS. 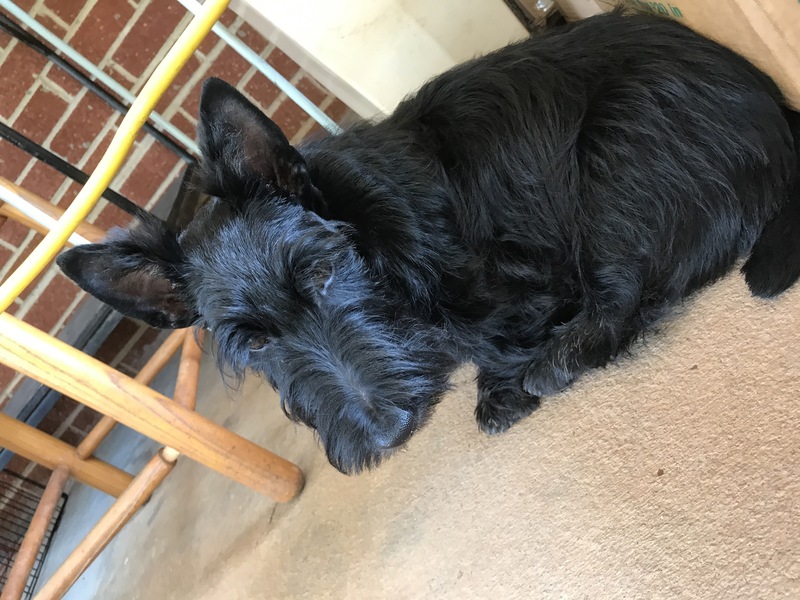 YOU NEEDED TO HAVE THIS PRECIOUS SCOTTIE IN YOUR ARMS……..NO ONE SHOULD BE WITHOUT A BELOVED PET. IT WILL BE SUCH FUN TO WATCH HIM GROW AND TO KNOW HOW SUCCESSFULLY HE IS TRAINING YOU. He is a lovely lad! Arrooooo to you! So very happy for your family. Tell us more. Oh my, what a cutie! So looking forward to hearing the details! Congratulations little one, you found your forever home. What wonderful news! I’m so happy for you and can’t wait to hear more about him. He will have the best home there is! Congratulations to you all!! !